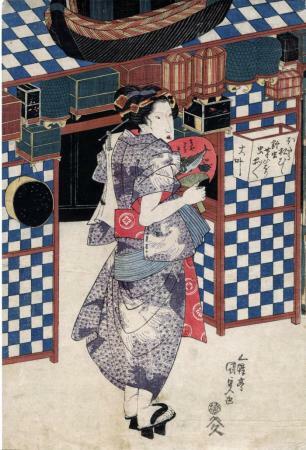 The fan the woman is holding looks very much like it is decorated with a Hiroshige fish print. Also, as best we can tell the writing on the box attached to the vendor's blue and white checkered booth says something like: "Various different insects are sold in cages." There are two Hokuei 1832 panels illustrated in Kamigata yakusha-e shūsei (Collected Kamigata Actor Prints) Volume 2, #288, p. 93. The one on the left shows a woman standing in almost the same position in almost the same summer clothing, in front of the portable stands of insect sellers. She, too, is holding a fan and has a white towel draped over her left shoulder. One particular difference between the Kunisada print and the Hokuei is that the Hokei has a small child in front of the woman. The similarities are too great to be a coincidence.